Guys I got sick again in Vienna. So, I spent much of my time there sleeping and drinking tea. 1. The public transportation is brilliant. Maybe I happened to stay in a particularly centrally located apartment. 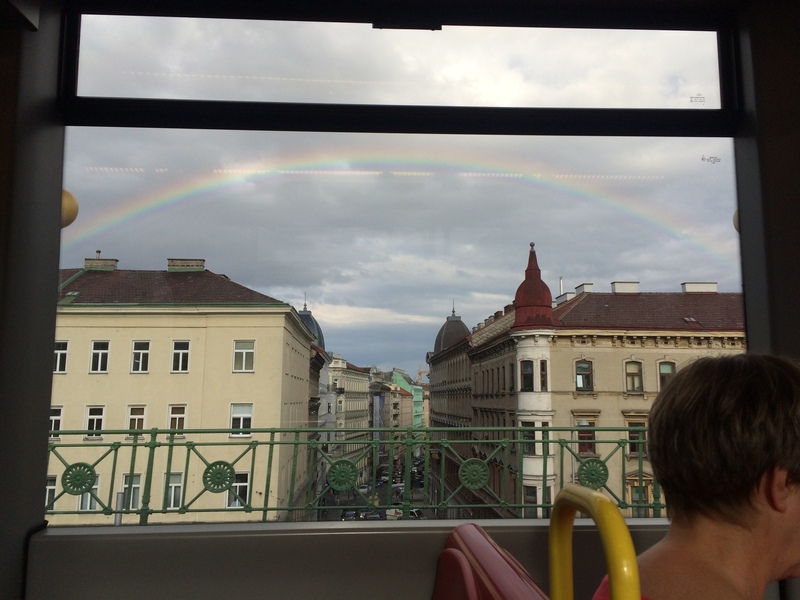 But the tram, metro, and bus systems in Vienna appear to be extensive and efficient. I love that you can use the same card for all three. I love that you can just hop on without having to present your ticket (often stepping right off the sidewalk). I love that you almost never have to wait longer than 10 minutes for a car. 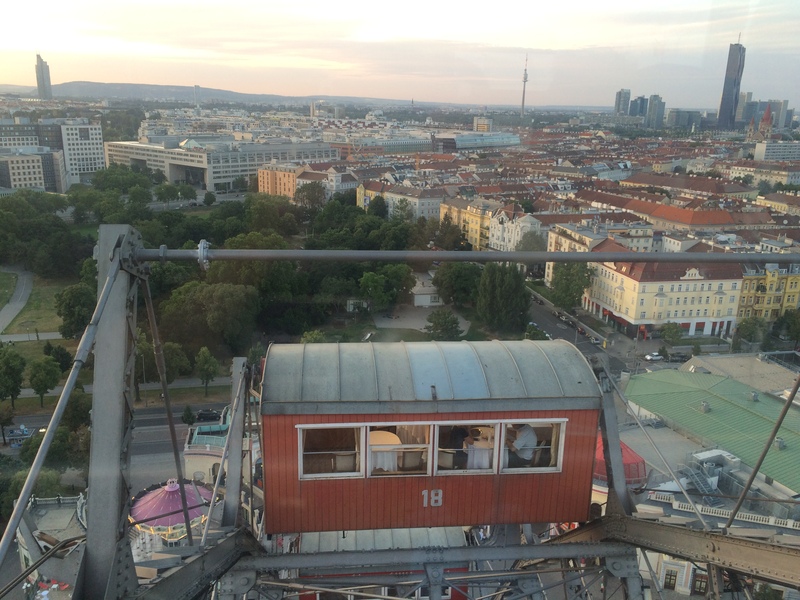 I was particularly fond of the cheery red trams buzzing along the streets and took Tram 1 and Tram 2 around the Ringstrasse (road encircling the city center) the first day of my visit to get a bird’s eye view of the city. Another benefit of the tram is that you can see everything along your way (rather than being stuck in the dark underground). 2. The Danube is humming. One evening, just before dark, we descended a staircase to walk on the paths that run alongside the Danube. Although literally just a few feet from the most touristy part of town, we felt like we were a world a way. I loved seeing all the locals lounging on chairs sipping beer and chatting over dinners in makeshift gardens. 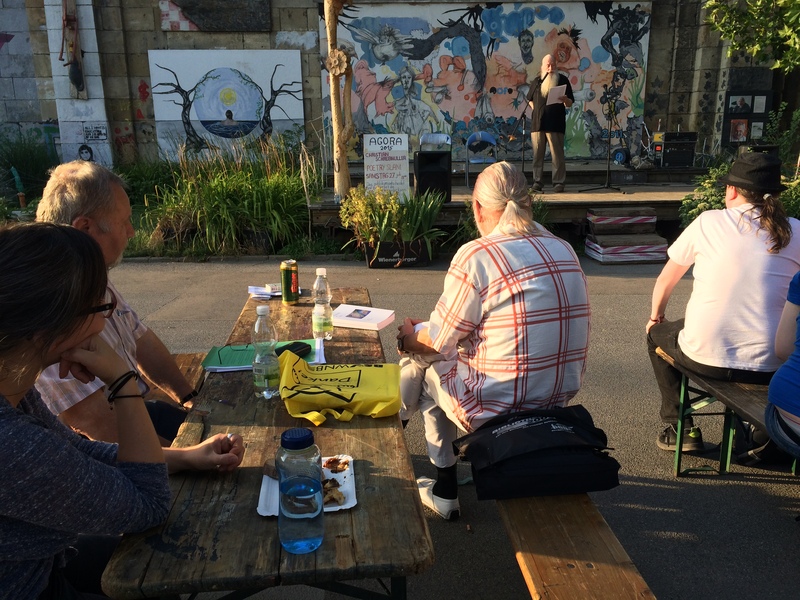 We even stumbled upon an al fresco poetry slam. 3. The evenings offer perfect amusement park weather. After strolling along the Danube, we popped into the Prater (Vienna’s resident amusement park) to ride the Riesenrad (ferris wheel). The twenty minute ride afforded a perfect view over the city, especially at sunset. The car next to ours was reserved for a romantic candlelit dinner, and I have to say we drooled a bit every time they floated by – pure magic. 4. If you get too hot, you can duck into an amazing museum. Or two. Visiting Schloss Belvedere – home of the largest collection of paintings by Gustav Klimpt – was high up on my to do list. 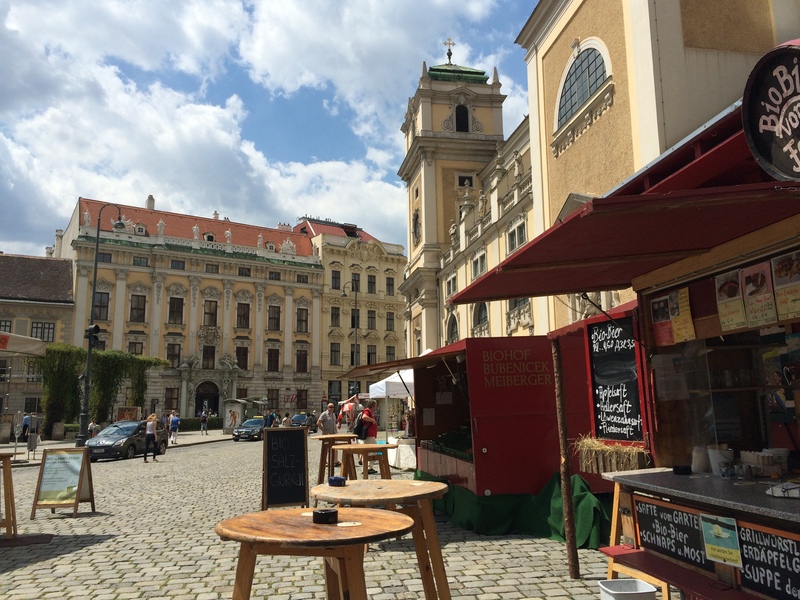 But in my state of needing to rest and drink tea every five minutes, the location (which in reality was just a tiny bit beyond the city center) seemed like too much of a stretch. Instead, we opted to museum hop in the museum quarter. For a discounted price, we got a combined ticked which gained us admission into both the Leopold Museum and MUMOK (the modern art museum). 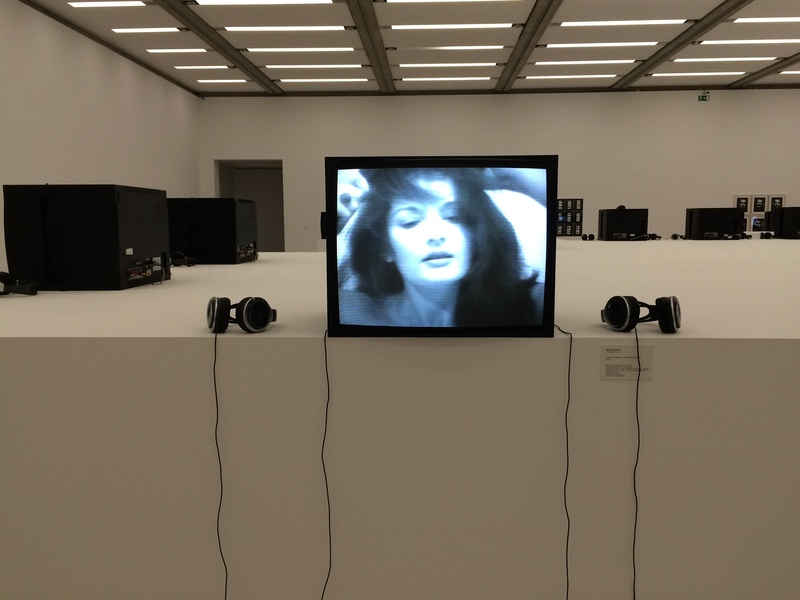 We were shocked by how thin the crowds were in the light-filled, air conditioned rooms, but grateful for the opportunity to take our time taking in works not only by Klimpt but also Warhol, as well as an outstanding exhibit on performance art. 5. You can while the afternoon away nibbling a slice of cake at a coffeehouse. Because I was sick, I did not eat nearly as much cake as I had planned (probably for the better). My very last day in Vienna, however, I bit the bullet and sampled some apple strudel at the very traditional Café Landtmann. 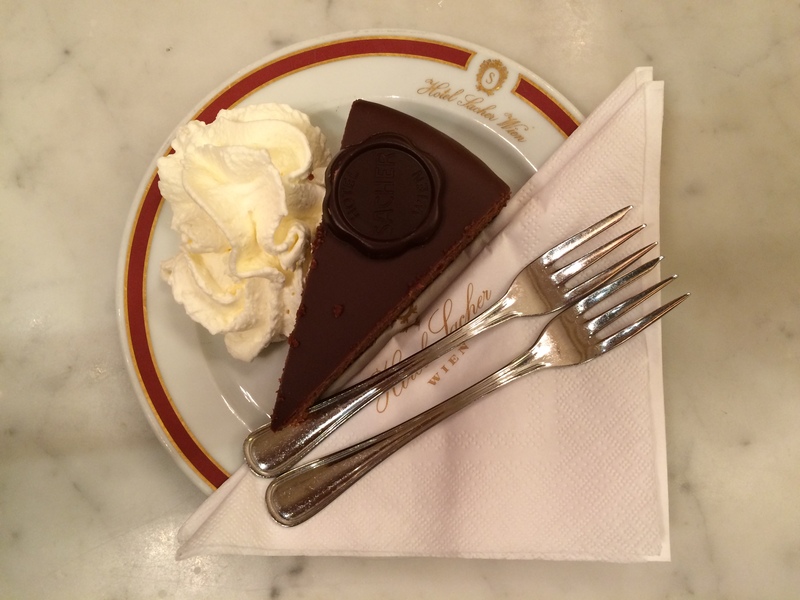 And, right before we packed up our suitcases, we made a final dash downtown to try the sachertorte at Café Sacher. I could not taste anything, but my appetite was whet. Maybe next time, some Sperl Torte at Café Sperl…? I hope to visit again soon, Vienna!